I created this one for my Kris who blogs at Krislovesfabric. Her prompt was: MAKE. My postcard note said: "Kris you make very beautiful gifts and I'm sure they bring sunshine to many hearts." and the one that traveled through the mail from Michigan to Oregon to little ol' me! This one was created for me by Sunshine'sAddiction using my prompt: HAPPY. She illustrated that happy transition many us feel as Winter finally turns into Spring. 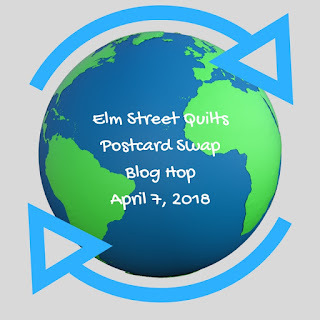 Well today we are having a Postcard Blog Hop of many of us who participated in the swap. 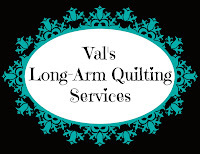 Here's a list of today's Blog Hop participants to check out. ENJOY! Both post cards are so pretty. Yours, I think is very apt.....you will be beside yourself with happiness when Spring does begin to shine over there. Both cards are very cute. Sounds like a fun swap. Two adorable fabric postcards. The Swap was really a lot of fun, wasn't it? Aren't those cute? How fun that you had word prompts to make them! It was a fun swap wasn't it? I love the postcard you made for your partner and I can feel the sentiment in the card you received. Oh I can so totally relate to the one you received! I think that just (but barely) edges out that same happy I had round about June 30.... (you know the happy I mean, ha!) Love the make one you made, and interesting how you put sunshine in it, and you received from a girl with sunshine in her blog name! These are just adorable. The hop has been fun, I love seeing all these tiny pieces of art. I have enjoyed seeing all of the creative postcards from this fun swap! Love, love, love the transition from winter to spring! I am one of those who is longing for the freshness of spring! Oh these are FUN! A bunny playing peek-a-boo with a heart and snow melting into spring! (We are wishing that would happen a little faster over here!) Well done to both of you! Ha! We chose the same prompt word. That's awesome. :) Both your cards, sent and received, exude joy. Love them. What a great interpretation of the HAPPY and MAKE! Well done, both of you! It was a fun swap and I love the transition from winter to spring on the one you received. It is sure to make a Northerner happy by this time of the year. What a great deal of fun we had doing this swap. "Make" was a great prompt and left it wide open for your imagination. Well done. Both of these are such happy postcards! Thanks for being part of the postcard swap and hop! I love the sweet design you made for your postcard to Indiana. And I had to laugh at the one you received from Michigan. That one is just wishful thinking at this point because so far there has been no transition to spring here. In fact, it’s snowing again as I type this. We can dream, though, can’t we? Oh, wow! I would have been completely stumped with "Make" as a prompt. You did a really fantastic design job with it!